Have you ever created any viral YouTube Videos? If it so Did you get a lot of views? Making Viral YouTube videos and getting lot of views is trickier one. Tech users have more knowledge about creating YouTube videos and adding better effect, uploading videos to YouTube. On the other hand, How about newbies and non-techie users, if they want to make YouTube Videos and adding some cool effects and presentation. They also can create YouTube videos using many Free Windows software. In this article, I’ll point out how to make YouTube videos with “Ezvid” which is a free Windows YouTube Video maker software and uploader. Using this video maker software you can capture you screen as well you can edit the captured video. Some of the features of Ezvid is Voice recording, face cam, voice synthesis, screen drawing, speed control. With one click, you can record your screen with Ezvid, and capture whatever appears on your computer screen: Web pages, games, applications, paint programs, maps — the list goes on and on. Just click the “screen capture” button, and you instantly being recording your computer screen. Edit your video and then save it for later, or upload it directly to YouTube: the choice is yours. 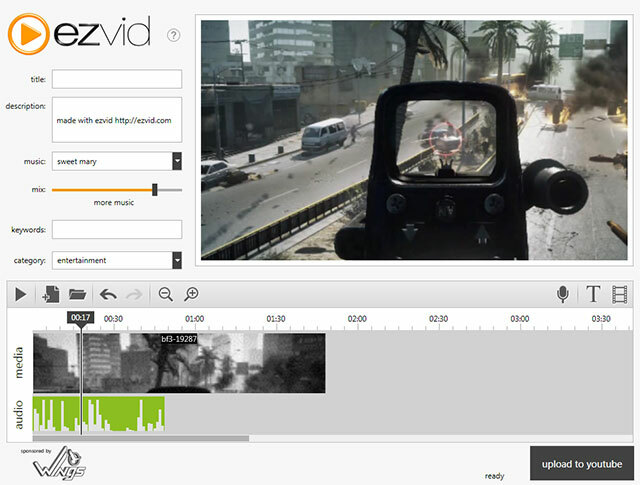 By using Ezvid you can create videos with more sharpness and detail with High resolution. After that you can edit these videos, make speed changes, re-arrange, add text, image slides, and much more, creating a video in minutes instead of hours. Ezvid uses the latest C++ binaries to take advantage of modern multi-core CPUs and video cards, but Ezvid has been carefully designed to increase the speed of screen recording.